If you want to stay informed about the latest exhibitions and projects or other news concerning the artworks of Peter De Cupere. Subscribe the newsletter. MILAN— We are pleased to announce that artist Peter de Cupere is for the second year nominated for the 2018 Art and Olfaction Awards, which we made public in a special press event at Esxence, in Milan, on April 5, 2018. 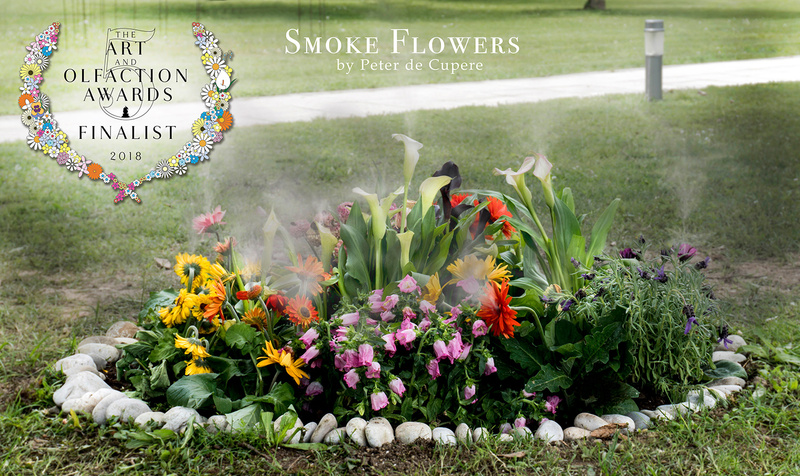 With the work Smoke Flowers Peter de Cupere made once more a statement to the society. “Moved by the abusive impact that modern industry and contemporary lifestyles have on nature's purity, the artist has managed to conjure real flowers to regurgitate the fumes of industrial pollution”. In Smoke Flowers, artist Peter de Cupere lets big and small flowers take revenge on the human population by regurgitating industrial air pollution. It is not what one would expect from the sight of these delicate flowers. Flowers do still give the world a bit of color, lushness, efflorescence and - typically - they smell delightful. All this beauty melts like snow before the sun at the sight of the Smoke Flowers. The work itself has a dreary quality and at the same time is very poetic. Spectators are transfixed by the little flowers which spit out a hint of smoke every now and then, emitting the scent of air pollution. Yet the spectator has to put in effort and has to come near to the flowers. They have to bend down, be attentive, look back and once again look attentively at the abundance of nature to then experience, unexpectedly, this poetic occurrence of smoke coming out of a flower. Realizing that the hint of smoke contains the scent of intense air pollution and not the pleasant scent of a flower, the spectator is forced to question, reflect and go back to nature. The fragrance of the polluted air was created by the IFF Research Lab. The work criticizes our social attitude towards the urban and industrial pollution. It beseeches us to reflect on air pollution for not only do we as people suffer from it, but nature too is a victim. Awarded to just four perfumes, one experimental scent project and two special awards — the Aftel Award and the Contribution to Scent Culture — a year, The Art and Olfaction Awards are designed to raise public interest and awareness around new developments in independent perfumery. The Awards, established in 2014 by the Institute for Art and Olfaction, are given to outstanding creators in the categories of independent, artisan, and experimental perfume from across the globe, chosen for perfumes released in 2017. The fifth annual Art and Olfaction Awards events will take place in a public ceremony at The Tabernacle. Continuing the tradition of holding the awards in unique locations in different perfume capitals of the world, the Tabernacle is a Grade II-listed building in Powis Square, Notting Hill, west London, England, built in 1887 as a church and converted into an arts center in the 1970s. Each Art and Olfaction Award winner will receive The Golden Pear, which continues to cement its status as a prestigious achievement in the perfume world. 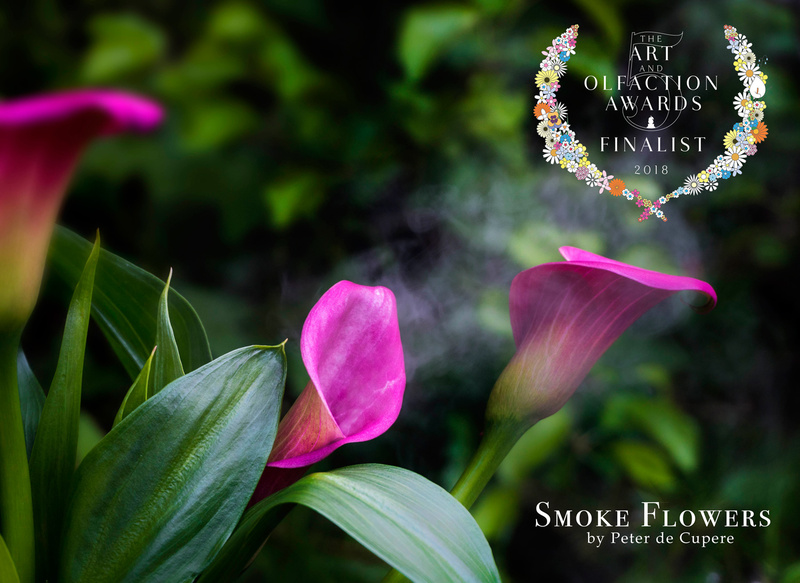 The Art and Olfaction Awards was founded in 2012 as an independent awards mechanism designed to celebrate innovation and excellence in artisan and independent perfume, and experimentation in scent within arts practices. The Art and Olfaction Awards are a program of The Institute for Art and Olfaction, a 501(c)3 non-profit based in Los Angeles, CA. The Art and Olfaction Awards could not exist without the generous support of our partners at Lucky Scent / Scent Bar, Pochpac, Perfumers Apprentice, Esxence, Barrister and Mann, Aftelier Perfumes, Nez – La Revue Olfactive, Basenotes, ÇaFleureBon, AutumnSeventy, Perfumed Plume Awards. The Institute for Art and Olfaction is a 501(c)3 non-profit based in Los Angeles, CA. The Institute for Art and Olfaction advances public and artistic engagement with scent. We do this by initiating and supporting arts projects that utilize the medium of scent, by providing accessible and affordable education in our experimental laboratory as well as in partnership with institutions and community groups, and by celebrating excellence in independent and artisan perfumery through our yearly award mechanism, The Art and Olfaction Awards. Through these efforts, we extend the world of scent beyond its traditional boundaries of appreciation and use.